The right bank in the lock. 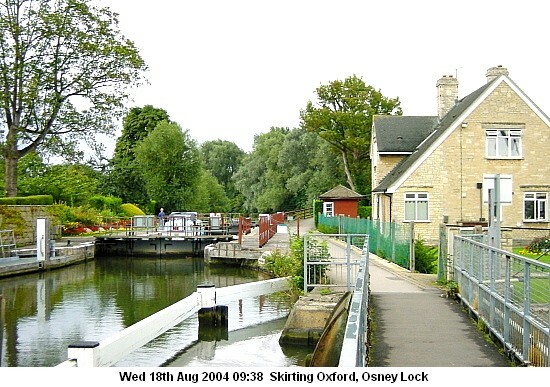 "Osney" is locally pronounced "OWES KNEE"
A towpath crossing opposite the Osney Bathing Place. It was formerly of timber, with three openings; exceedingly troublesome to the barges on account of the abrupt turn into it. A cluster of old houses points out the site of Osney; we first pass, however, through Osney Lock, one of the most picturesque locks on the river; although its accessories are only low houses and broken walls, they are such as the painter loves, and to our friend, Mr. E. W. Cooke, we are indebted for the sketch of which we append an engraving. 1880: Fred Thacker - the towing bridge below the lock was to be rebuilt in iron in February 1880. Under the footbridge in the photos is Osney Pool on the LEFT bank. Here the Environment Agency runs the barges which miraculously turn the Thames into a usable river. I think we should not underestimate what is involved. 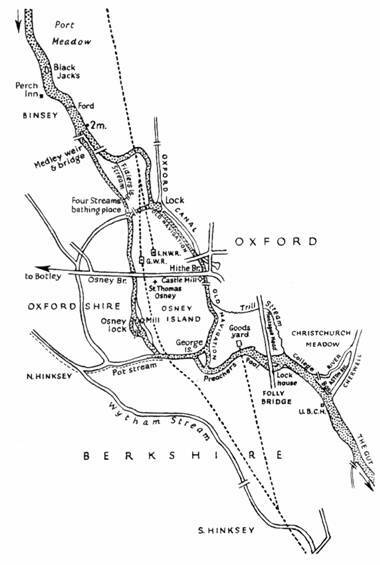 When the Oxford Canal was first opened all the London trade immediately came via the Oxford Canal and the Grand Union, it was so much swifter and cheaper than down the river! Our river is now a marvel of engineering and we should not let its beauty blind us to the human contribution. Straight through the pool under a bridge is another branch of the Bullstake Stream which can be followed for about half a mile around the backs of houses and factories until it divides. The left hand branch goes off under the A420 and then is joined by a stream from Four Rivers and goes under the bridge with the tiny weir (see Bullstake Stream). The other is another weir overflow from above Osney Lock. Neither branch was I able to follow more than a few yards. Junction of streams above Osney Weir Pool. This is one of the more difficult locks on the whole river. However having said that, in times of normal flow, there is no reason to be worried. Make sure your passengers remain seated and quiet. 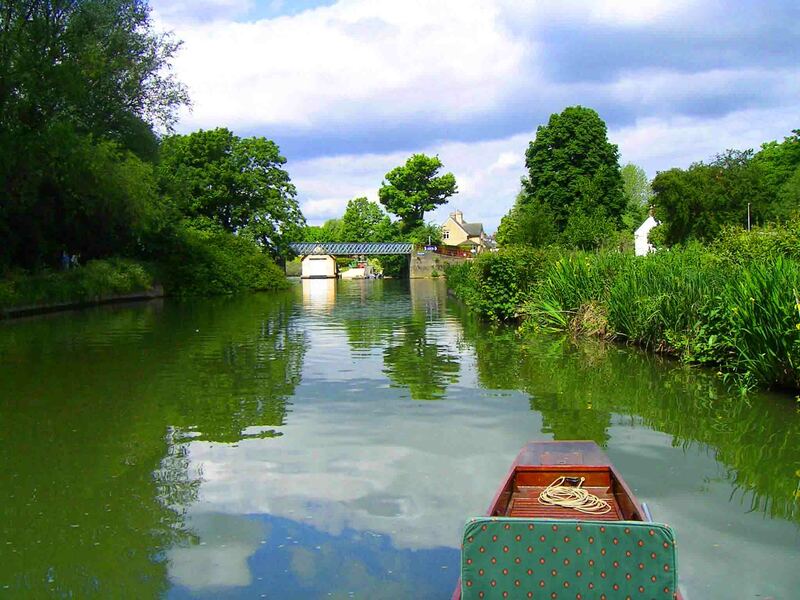 The lock keeper will see you through without hesitation (as long as he sees you in the first place - small manually propelled boats can get overlooked when the keeper is expecting the noise of an engine to alert him). Coming upstream the lock is on your right (the RIGHT bank). 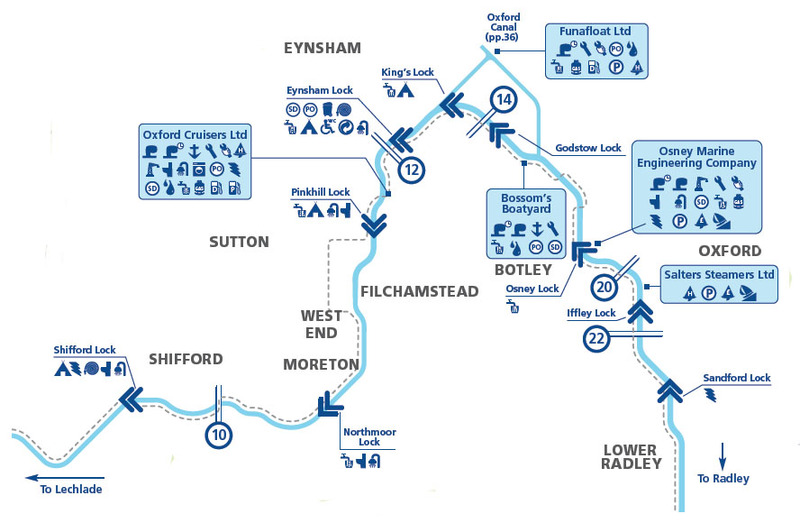 Hold on to the mooring as close to the lock as reasonable (taking your place in the queue if there is one). When the gates open do not enter the lock until signalled by the lock keeper - there may be other boats in the lock that you cannot see. 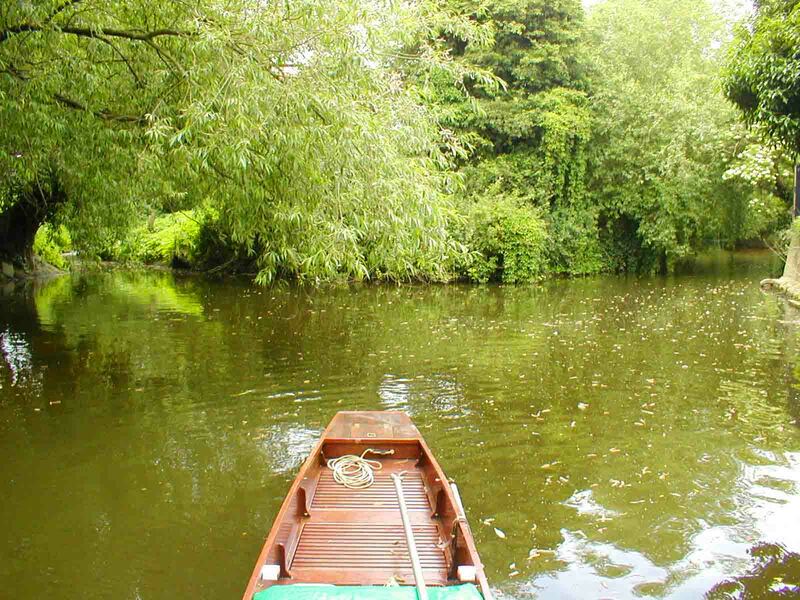 The keeper may also allow other boats in ahead of you for safety reasons. Be patient, your turn will come. Once in the lock, if you have a choice, stay well towards the downstream end - because, if there is turbulence when the water is let in, it will be at the upstream end. 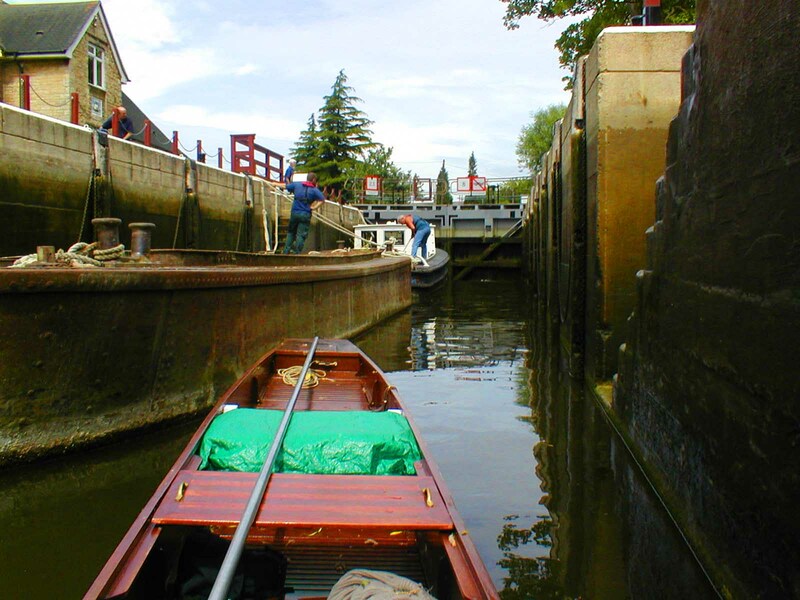 In a punt or canoe hold on to the vertical chains and do not let your boat drift around in the lock. Encourage powered boats to leave before you and keep hold of the chain until they do. Going upstream, immediately above the lock keep well to the right (to the RIGHT bank side) because the river is narrow and there is a weir to your left (on the LEFT bank). In times of high water this can be very difficult and Osney Lock may keep RED BOARDS, ie No navigation, displayed rather longer than other places because of this weir above the lock. Boats queuing to come downstream will queue on the 'wrong' side, ie their left and will also be trying to keep away from that weir - so beware. Whereas the wear in the Thames is a nuisance to the Friars preachers of Oxford and they purposed to move it to another place where it cannot hurt them, and whereas it appears by inquisition that it is not to the hurt of the town to move the wear, the King, commending their charity in this behalf, not only grants licence to move the wear, but thanks them for doing so. 1789: Osney Pound Lock built by prisoners. 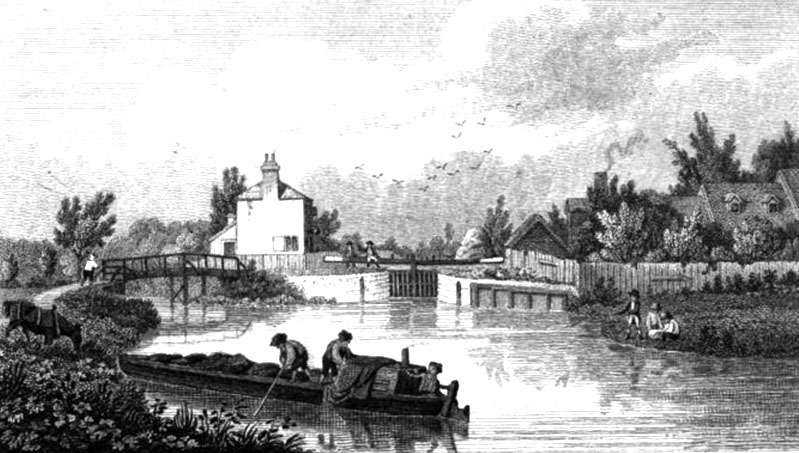 1811: Osney Lock Gates were forced by local malefactor, which stopped the navigation for 5 or 6 days. The offenders were possibly enraged by the fact that the lower sill was so high that barges had to unload into lighters in order to pass. 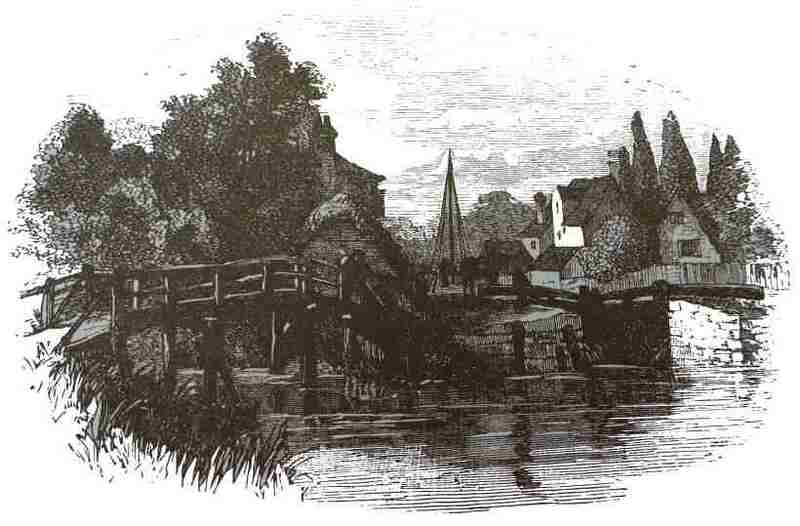 Osney Lock in 1859, Mr & Mrs Hall. Osney old lock, says Mr. S C Hall, who with his wife ... wrote that charming old book of theirs about 1850 , was extremely picturesque and a great favourite with painters. Did they work it as threadbare as their successors did Iffley? Dilapidated it was even in his time. 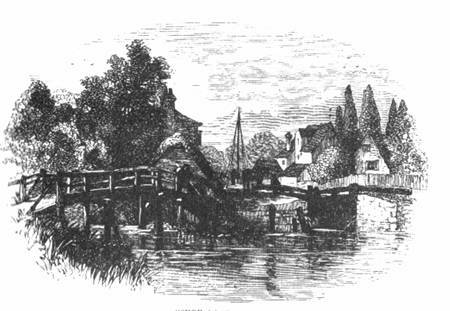 The present lock, however, nearly a mile from Folly Bridge, has something of the same pleasant surroundings, approached along a willowed bank and overhung with tall shady elms. "Wee see whatsoever heart could wish these monks did enjoy; and expended much infinishing of pleasant walks by the river's side and invironing them with elm-trees and also orchards, and arbours that were divided with cunning meanders; as also fishponds, dove-houses and what not. Besides this a pleasant retirement to Medley." It is a lovely haven, the millhead stream, looking far removed from the modern world of railways and stores that are actually so near. "Very quiet", I hazarded to the maid who led me round to the surviving stones. "Yes", said she, "but not too quiet; I like it so." And you will like it when you behold the little glassy reach of clear water, in which shine reflected the feathery arches of lofty overhanging willows. Usually the remains are correctly described as of Osney Abbey, yet not invariably. The occasional confusion with Rewley so close at hand arises, I think, from both abbeys having owned "locks" upon the ancient or the present navigation. Osney indeed grew to have four; great "neausances", the city complained; and Wood mentions the "lock" by "Rewley Garden". But these "locks" were no more than stanches across the stream holding up the water which, when allowed to escape flooded craft over the shallows below. Just above Osney Lock are the city electric works. A group of willows used to hang over the opposite bank, and it was evil passing if a barge or two wished to share the channel, as often happened. But I found the trees cut down, and the scene all the more bare and thirsty, in the spring of 1906. We now come to a very interesting and unique section of river. From here until Osney Bridge we are part of an urban landscape that could be a canal in the Midlands, bordering a street on the LEFT bank and factories on the RIGHT. A few yards above the lock on the LEFT bank South Street runs at right angles to the river and up there is "The Punter" (which was "The Waterman's Arms" and has now had a makeover) If that isn't an invitation to punters to come up here I don't know what is! And the food is reported to be good ... 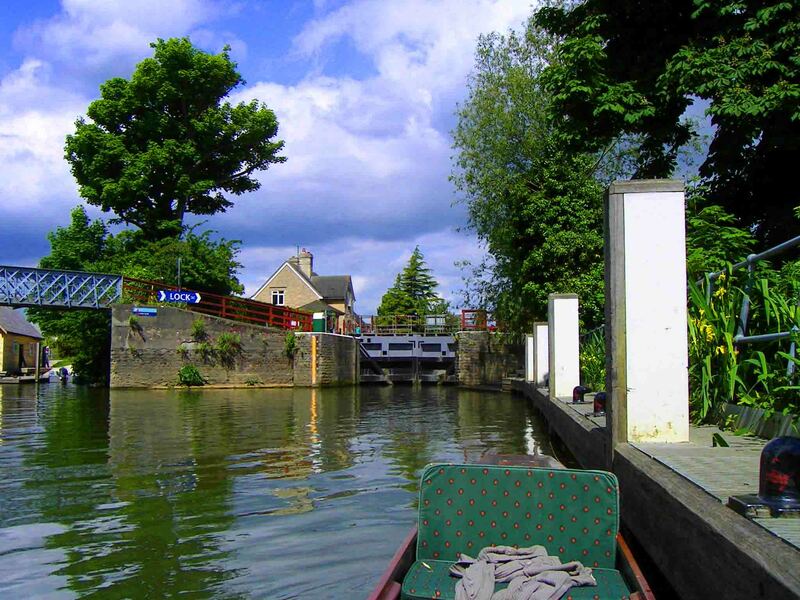 However coming here specially by punt means coming up through Osney Lock - and then where do you leave the punt in safety? Just above Osney Lock I met a distinguished looking man pushing a punt slowly upstream in the face of the gathering storm. A few minutes later I passed through the lock and the keeper told me the man I had just met in the punt was the parson of Stepney who had gone up the river that way every summer for the past twelve years and had always gone through Osney Lock in a thunderstorm. This fits very much with my feelings about the river upstream of Oxford. 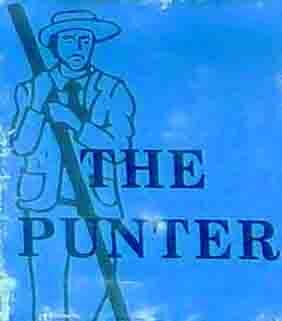 It has something against clerical punters! Let this area catch so much as a hint that a clergyman punter is coming its way and thunder and lightning ensue in short order. Perhaps its because we deny the gods - standing on a punt with shelter several miles away at two miles per hour makes one very aware of the weather! Dr Plot is impressive about a thunderstorm on the tenth of May, 1666 which rather terrified Oxford, but was "mischievous only at Medley, a well-known House [The Perch? ]; two scholars of Wadham College, alone in a Boat and newly thrust off shore to come homewards, being struck from the head of the Boat into the Water, the one of them stark Dead, and the other stuck fast in the Mud like a Post, with his Feet downward, and for the present so disturbed in his Senses, that he neither knew how he came out of the Boat, nor could remember either Thunder or Lightning that did effect it." In those days the two Scholars would quite likely have been about to take holy orders and therefore obviously counted as clergy for this purpose! Then took her onward road. To the home of earth's desires. Among the leaves of spring.